Well, that was a surprise. Normally on Bank Holiday Saturdays numbers are low. But 21 riders – a record for recent years – joined the ride last Saturday. Fortunately David was there and looked after the back of the group, in particular encouraging people to “Go, go, go” when crossing lights went green. The beautiful sunny morning probably helped, and we certainly enjoyed that. In remarkably light traffic, we followed the route of the projected Quietway 2 (currently out to public consultation) from Swan Mead to The Cut. Then through to the South Bank at Gabriel’s Wharf. From there followed the river using Nat Route 4 as far as Southwark Park, squeezing past the crowds at Borough Market. Running late, so skipped the South Bermondsey loop and headed back to Peckham from Southwark Park. Route, including short cut, at: http://goo.gl/pFcXTo . 17 riders set out at 9.30 from Canada Water for another “+” ride with Bruce leading and David assisting. Headed for the river at South Dock, then NR4 following the Thames to Greenwich. Collected a further rider at the Cutty Sark and continued along the river all the way to the Thames Barrier. Amazed to see one of the Thames Clipper boats beached on the sandy mud (it was low tide) by the O2. Thought this might be a navigational error, but subsequently found that Thames Clippers deliberately do this to allow the removal of debris from the impellers in the jet system. After a longish coffee stop at the Barrier, returned by the same route pretty much. Back at Canada Water bang on 1pm having covered about 17 miles. 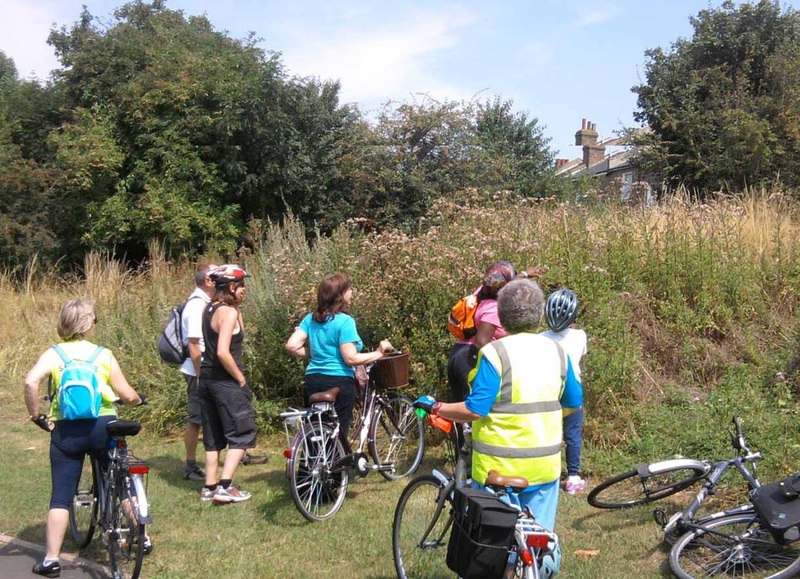 Healthy Ride, 2nd August 2014. Report from Philippa who led the ride. Next Sunday Philippa is doing the Ride London 100 raising funds for the charity Whizz-Kidz - a great charity that supports disabled children by providing them with specially adapted wheelchairs, doing wheelchair skills training and providing youth clubs. She would be grateful for any support! Philippa has a text giving service set up through Just Giving so you can text a donation. Just text 70070 with the message KOSA66 £x where x is the amount you are donating. Or go to the Just Giving web site, link here. Despite a heavy downpour one hour before the start, there were 12 riders at Canada Water at 9.30 for the second Healthy Ride +. Werner leading took us over Southwark Bridge to the British Museum via the Guildhall, Smithfields and Lincoln’s Inn Fields. After a coffee stop, on to the Inner and Middle Temples via the statue of Hodge, Dr Johnson’s cat in Gough Square. Very pleasant in the quiet of legal London, although some interesting activity on view. A group of actors rehearsing outside Middle Temple Hall and 4 ladies in period dress with lovely old bikes doing a photo shoot. Home via a very congested Victoria Embankment, Westminster Bridge and Nat Route NR4 along the south side of the river. Weather became warmer and sunnier as the ride progressed. After the dynamic forecasts of the last few days it was difficult to predict how many would show up for today's healthy ride. However, there was a good turnout and 15 set off from Canada Water and the sun decided to join us. Via an already busy Southwark Park and after two cautious crossings of Hawkstone and Rotherhithe New Road all riders managed the first mountain stage, the zigzag from Oldsfield Grove over the London Overground line. Then a string of quietly connected parks (Folkestone Gardens, Fordham Park and Margaret McMillan Park) to a serious but overlooked obstacle: Deptford Market's spread into Douglas Way. Thanks to Lewisham for the contra-flow from Comet Street to Reginald Street, that let us join route 21 at the Birdsnest roundabout. Then the shared pavement/segregated lanes got us over the A2 and into a lovely and still very empty Brookmill Park. Some more zig-zagging to get above the DLR at Elverson Road and some more complex geometric activity to get down on the other side. I assume the planner had decided the length first and then had to fold it up to fit into the space. But both railway crossings were a pleasure to ride, there are barriers but they aren't chicanes. We then (more or less) followed route 17 into Greenwich Park and "because it's there" some of us decided to race to the top. Bromptons did very well in both categories, they should offer a polka-dot version. After negotiating half the blight on Greenwich's town-centre we were welcomed by Community Liaison Officers who told us that we were expected to do the whole gyratory, strictly verboten to ride the 50m past the Cutty Sark before joining NCR 4. Continued along the river, noticed that the bridge over Deptford Creek isn't yet there and took a very long but nice detour over the Ha'penny Hatch bridge just to avoid the nasty right turn off the main road (and to take a long rest while waiting for the least helpful crossing-light on the route to favour us). The canonical riverside route with a bit of extra through Russia Dock Woodlands and around Stave Hill got us back to Canada Water bang on time.